As mentioned above, side two contained the live recorded "Miss Fortune", almost a direct cross between Velvet Underground and early Pink Floyd. However, to use the term "live" is to mislead - the tapes were manipulated with just as much studio wizardry as the other recordings. Overall, the album was a true musical manifestation of post-modernism: it was undeniably a peculiar album, but it is also evident that all this weirdness was carefully constructed! For every strange effect and strange happening, Nettelbeck certainly thought: 'I'm sure everyone will find this one here really outrageous! Needless to say, Faust fans everywhere are delighted with the results and I still think it is a great and unique album! Buy it and judge yourself! The sleeve concept, an x-ray image of a fist, printed on transparent plastic, was a full-blown use of the original idea for Second Hand's first album Reality. Indeed, their Death May Be Your Santa Claus displayed some ideas quite similar to the content of the first Faust album! In addition the insert, with liner notes and general information by producer and director Nettelbeck, and the vinyl itself, was clear. Even so, the album was hardly noticed in Germany at the time of its release, in fact it actually sold better in the UK! The packaging of the second album So Far (recorded March 1972) was even more outrageous. Enclosed were TEN inserts - one lithography each for the nine "songs" plus a general info sheet. The sleeve itself was plain black, as were both of the record labels! Musically, the album was more "together", i.e. not being much dominated by as many rapid edit changes as its predecessor. Still, the material was unconventional to say the, least, combining many different styles. Among the great triumphs were: "It's A Rainy Day, Sunshine Girl" (so go the lyrics all the way through, over a silly, rapid drum beat), "No, Harm" (this time featuring another repeating hook line) "Daddy, take the banana, tomorrow is Sunday", (a more angst ridden amphetamine blow out with deranged treated guitars), "So Far" (an ever repeating pseudo western beat with early Floyd-like, sound effects added) and "Mamie Is Blue" (dense, rhythmic nightmare noises recalling the atmosphere of their first album). The five shorter tracks were humorous pastiches on jazz, pop, etc. An improvement on their first album in my opinion. In fact, this album wasn't too distant from what Can did at the same time either. In October 1972, Faust recorded a collaboration with the American minimalist music composer Tony Conrad. He had also been member of an early Velvet Underground formation and the group La Monte Young. The British record company Virgin released their joint effort in 1973 on their Caroline subsidiary Outside The Dream Syndicate contained two very long pieces of) serious avant-garde and rock minimalism that crossed certain) pieces of So Far with Terry Riley's In C, performed by Conrad, Diermaier, Peron and Sossna. If 60 minutes of extremely minimalistic music made up of repetitive sounds seem tempting, this is the album for you! However, it's hard to get hold of nowadays, as it never has been re-released. Expect to pay 50 DEM for a original copy. Faust Tapes (1973) was indeed a collection of Faust tapes from 1971 to 1973, and a return to the common cut and pastel techniques. The music of Faust Tapes ran continuously, a bizarre, but highly rewarding experience. Issued at the same price as a single, it sold so well in Britain that it entered the charts! However, many dissatisfied (and horrified) customers promptly went back to the stores to exchange the record after one hearing! German experimental rock fanatics have nevertheless had a long lasting passion for it and many people regard it as Faust's best. The group performed live in London on the day of release on 19 May 1973. 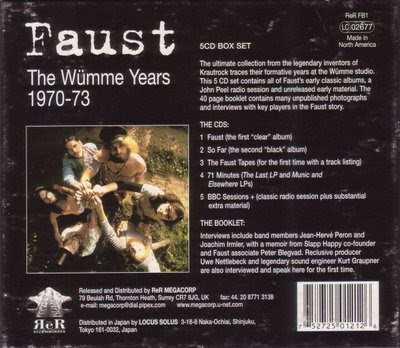 Their last album, Faust IV, was recorded at the Manor, Oxfordshire, England in June 1973 (but Kurt Graupner was as usual present as engineer). Then Faust returned to Germany. The album marked a downward turn, but the profound "Jennifer" and "Krautrock" (12 minutes of just that!) again captured an inventive group in action. 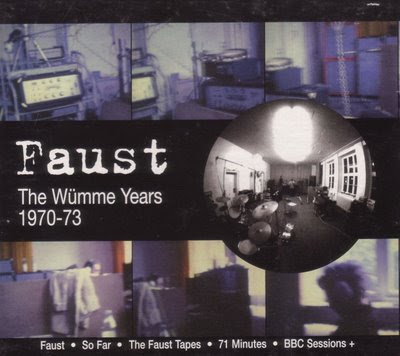 Disagreements about their future musical direction led Faust to disintegration in August 1973, but various re-incarnations, among others involving Uli Trepte (ex-Guru Guru) and Peter Blegvad of Slapp Happy fame, centring around Diermaier, performed live until Spring 1974. Then Uwe Nettelbeck found it impossible to keep the involved musicians together as a productive unit, and consequently withdrew from the project. This was the end for Faust. The British record company Recommended recognised Faust as true pioneers of the Rock-In-Opposition movement and re-released their 1st, 2nd and 4th albums (numbered as below!) in 1979 and 1980. Some years later, some previously unreleased material cropped up on two 7 inch EPs. These, in addition to three alternative takes, were all collected on Last Album in 1988, released in 1988 numbered copies! Munich And Elsewhere (1986) was a second collection of great Faust tapes, both studio out-takes and live. A fine, posthumous sequel to the 1973 album. Ever since 1974, there have been some obscure Faust reformations from time to time, but no further recordings are known. Can you PLEASE re-upp this? Would be great!